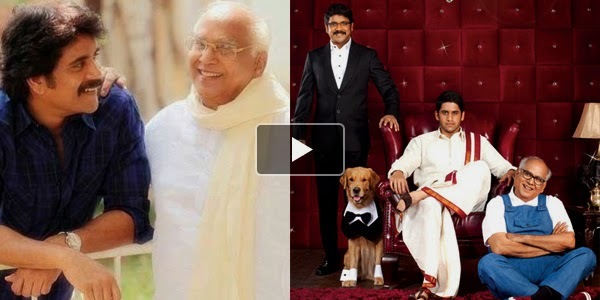 Nagarjuna Akkineni is on sky nine thanks to the success of his just released Telugu family-comedy "MANAM", which also features his late father Akkineni Nageswara Rao and son Akkineni Naga Chaitanya. Readers may recall in the early 70’s Bollywood Showman Raj Kapoor had the privilege of making a film with his father (Prithiviraj Kapoor) and son Randhir Kapoor in the movie KAL AAJ AUR KAL. He added, “He even insisted on finishing the dubbing as well, because he was afraid the tone of his voice might change. Watching his commitment has been overwhelming." Nagarjuna, fondly called Nag, by his fans, turns 55 today. He may have turned a year older, but he says: "Retirement is the last thing on my mind." "I don't think I will ever retire, but gradually like Amitji (Amitabh Bachchan), I will think of doing different kinds of roles. I will slowly start taking up roles where I don't have to singlehandedly take the burden of a film on my shoulders like I'm doing now as a hero," he said. Recently Nagarjuna has given his nod to film maker Ram Mohan (producer of UYYALA JUMPALA). The movie is directed by a debutant director Kalyan and will have Nagarjuna playing a dual role. It features Ramya Krishna, with whom Nag has given hit movies like SANKEERTANA, IDDARU IDDARE, CRIMINAL, GHARANA BULLODU, HELLO BROTHER, ANNAMAYYA, to name a few. The other heroine is being finalized. ఈ వినాయకుడు ఎవరో గుర్తుపట్టరా ? ?